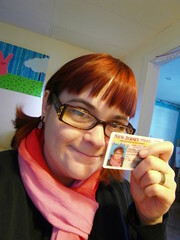 pretty nuts but after all these years i learned to drive and got my license on monday! monday afternoon i drove by myself for the first time. i never thought that i would find it fun to drive around. but i kinda do. so far now music or distractions but when i get more used to driving i will appreciate some mix tapes (cd’s) so get to work on those!!!! okay! my 11,000th photo on flickr! 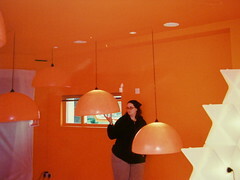 i was working @ six flags great adventure as the asst. manager of the paint-on (aka fake) tattoo stand. 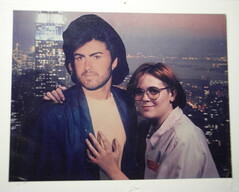 next door was the ‘take a photo with a cardboard cut-out’ stand and of course george decided he needed a photo with me! so realistic–eh?